As I mentioned in a previous post, the Minnesota Knitters’ Guild has been knitting Christmas stockings for a charity this year. 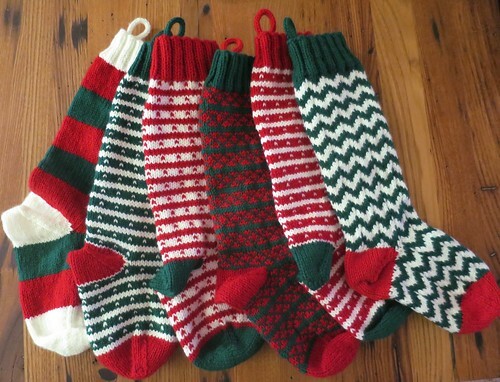 I finished six stockings just in time. I was weaving in ends and making i-cord hangers at knitting this week and everyone commented how much they loved the chevron version. So, I figured I’d whip up the pattern and share it with all of you. When I finished writing it, I decided it would be easy enough to add the instructions for the Stripes and Dot version and the X version as well. You’ll find those as bonus charts with abbreviated patterns at the end of the full pattern. Working a jogless stripe really make a big difference in how these look. Here is a nice tutorial on Craftsy on how to do one. In the pattern, I tell you which rows of the color work patterns to do this on. These stockings use and after-thought heel which is just like doing an after-thought or peasant thumb on mittens. Here is a Dummies tutorial on how to do one. 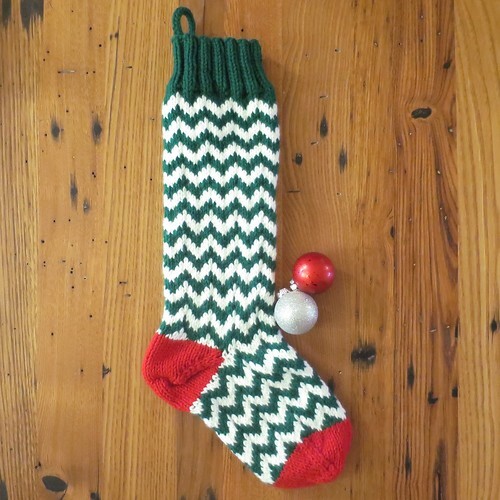 You can find the pattern for the red and green striped stocking here. It is quite a bit wider than my stockings and works the heel differently. Thank you for the patterns! And thank you for your generosity in giving us patterns and ideas all year long. My quilt guild collects fabric stockings for a local women’s shelter every year, but I always make them a knit stocking – the only REAL stocking! I can use this pattern for next year’s stocking. I haven’t tried jogless stripes yet, even though I’ve been knitting for about 65 years. This is a good incentive to learn that technique. They all turned out great! They look even better in person! Thank you for the lovely pattern! I love all of your stockings! I am new to knitting the afterthought heel technique. I am very confused as to why I ended up with 77 stitches after picking up the yarn above and below the scrap yarn. Where did I go wrong? Isn’t there supposed to be just 54 stitches for the heel? I would greatly appreciate any help on this. I sent you an email which hopefully will help! I sent you a reply with a photo attached. I am still hung up on the stocking!!! Where is the chevron pattern? I see the additional patterns, but not the chevron.